Target has officially unveiled their 2016 Black Friday ad to customers. After perusing through it, the company has some really great deals on Apple products for Black Friday this year. iPhone 7 and iPhone 7 Plus: $0 down, plus a $250 Target gift card for well-qualified guests. Target Mobile is for Verizon, AT&T, and Sprint customers only. Apple TV: Both the third and fourth generation Apple TV models will be 25 percent off. It should be said that this will be the last year to get the Apple TV third generation on Black Friday, so for collectors, this will be the best discount from retailers that you will find as of right now. Apple Watch Series 1: This model will start at $198. This is a savings of $71.99. There will be no discount for Apple Watch Series 2, which stays at its current price of $369.99. If you’re in the market for an Apple Watch, this is the best price we have seen so far for Black Friday deals. 9.7-inch iPad Pro: A baseline model (32GB) 9.7-inch iPad Pro will be priced at $449, a savings of $150.99. There are no discounts on the 12.9-inch iPad Pro at this time. This is the best price we have seen the 9.7-inch version of this tablet so far. iPods: Target will be discounting all current iPod models with a 20 percent off discount. This will include the current iPod Touch, Nano, and Shuffle. iPad Mini 2: Another big price cut is the iPad Mini 2, which will be marked down to $199.79. This model currently sells for $269.99 through Apple. Beats Solo 2 wireless headphones: These headphones come in several different colors. They will be priced at $119.99, which is a savings of $180. For iPhone 7 and 7 Plus users, these are the headphones and the price you have been waiting for. Beats Tour 2 earphones: These come in four different colors and will be priced at $64.99, which is savings of $65. Powerbeats 2 wireless earphones: Will be priced at $89.99 on Black Friday, which is a saving of $110. The ad also says that this is Target’s lowest price ever on this product. iTunes gift cards: The company will be running a buy one, get one 30 percent off promotion. It will include all prices of the gift cards ($25, $50, $100). 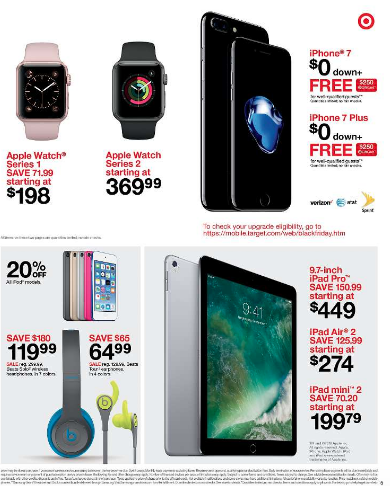 These are the current deals for Apple products and services by Target for their Black Friday 2016 sale. Target’s Black Friday deals are only available on Thanksgiving and the day of Black Friday. We are still waiting to see what Best Buy has up their sleeve for their Black Friday ad, but until it is released or leaked, we do not know yet. For now, We’re just going to have to play the waiting game.